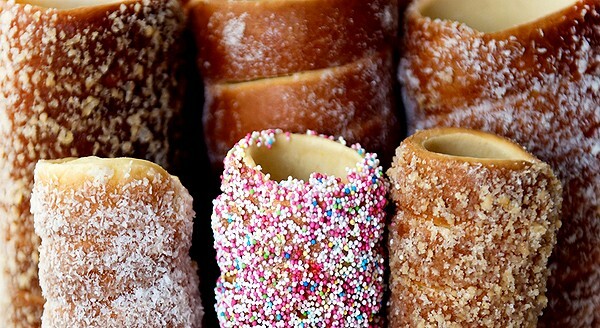 Chimney cake (kürtöskalács) is a cylindrical sugary roll of baked dough covered with walnuts, coconut and other toppings. It peels off in a spiral, making it fun to eat. 1. Begin by preparing the dough. Mix the dry ingredients together in a large bowl. 2. Whisk the liquid ingredients together, and add them slowly to the dry ingredients. Stir the mixture until it forms a light dough. 3. Knead on a lightly floured surface for five to six minutes. Set aside and allow the dough to rise for 40 minutes. 4. Roll out the dough and slice it into a long ribbon. 5. Brush a wooden spit or rolling pin with the vegetable oil. Starting from one end, wrap the dough around the spit, making sure to tuck in the end so that the dough does not unwind. The dough must be kept fairly thin (under 6 cm or 2⅓in) as you stretch and wind it. Roll the wrapped spit on the counter in order to flatten it. 6. Brush the dough with the melted butter, then bake over an open flame for six minutes. Gradually sprinkle sugar on top until it changes to a dark golden color. 7. Mix the walnuts with the sugar and cinnamon. Paint another round of butter on to the dough, then roll the completed pastry in the walnut mixture. 8. Knock the mould on a table to release the cake, then stand upright to cool for several minutes.